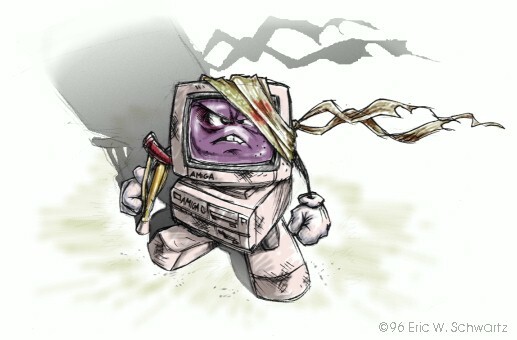 Amiga – The Survivor (made by Eric W. Schwartz) – Good illustration of the Amiga.. in 2012 it is still alive and there is even a new magazine in the making! If you are a Norwegian Amiga user or enthusiast, you might remember the old Amiga Guide magazine (Amigaguiden) that used to be released on a regular basis back in the day. Believe it or not, but the mag is actually making a comeback in 2013! 🙂 This time it’ll be published in English, so that people outside of Norway can enjoy it too. BREAKING NEWS: Do you remember #amiga guide magazine? #amiga guide magazine will be restarted. This time we will NOT specify how many issues we will produce per year, but we will GUARANTEE that the subscription will cover four – 4 – issues, 16 full colour A4 pages per issue, even if it takes over one year to produce this. This way we commit to no work other than when we want to and have the real Amiga guts, so it will be EASY to apply to this guarantee. So, this way, you pay for only 4 issues at a time. We will notify you when your subscription needs a renewal. We will also GUARANTEE that – if – we ever close down the production, then the rest of the subscription money will be returned to each subscriber. Subscription will include paper issue in English language, produced on an AmigaOne using PageStream under AmigaOS4.x, sent as class A post. Free PDF issues for anyone to read will be presented about one month later at AmigaWeb.net . #amiga guide magazine used to be in production from 2007 to 2009. For free download of old issues, please visit AmigaWeb.net #amiga guide section . Europe: 58 Euros per each 4th issue of #amiga guide magazine. World: 65 Euros per each 4th issue of #amiga guide magazine. Note: We do NOT cover the PayPal fee. Please visit us and have a live chat at IRC channels #amiga and #amigaweb at EFNet. I will frequently keep you posted of how many subscribers we get. I am surprised there isn’t a Linux magazine…or is there? I really don’t know. Haven’t looked up on Linux-mags recently. Must find out. 🙂 Sure there are a couple out there, don’t you think? I will definitely check as well.